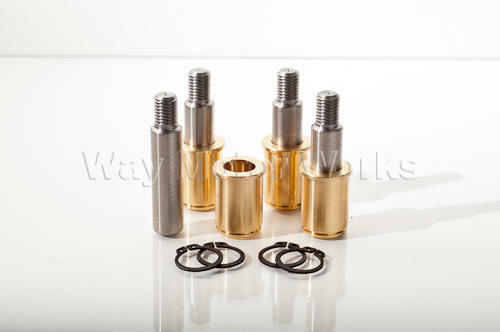 Brake Stiffening Bushing Set for 2002-2006 R50, R53 MINI Cooper and Cooper S and 2005-2008 R52 MINI Cooper Convertible. This is one of the biggest bang for the buck brake mods if not the biggest. These simple bushings replace the stock rubber bushings on the stock brake calipers. Replacing these bushings will alllow the driver to have a much firmer feel as the brakes will have less slope and act faster. These also help the pads to wear more even. These brake bushings install quickly and use either brake lube or anti seize for lubrication. Sold in sets for each axle, or set of front and rear. These do not work on the Front JCW brake calipers. I have had these installed for about 5 years and find them to definitely position the calipers correctly and keep pad wear very even. The only thing you have to be careful about is to be sure to service them once or twice a year. This would include removing, cleaning and re-greasing them. Be careful not to apply too much grease as it will attract and hold dirt which will cause the calipers to seize. It only takes a tiny amount for each stud.